The Intel NUC are very handy when you need a portable Windows lab environment (most geeks do need it) and recently I got an Intel NUC D54250WYKH and installed Windows Hyper-V Server 2012 R2 but after the installation I got a prompt that no network adapter present in my computer where it should be the Intel (R) Ethernet Controller I218. Windows Server simply doesn’t detect it, I install Windows 10 Technical Preview on my other NUC and it has no issues with the network device. So search over the net and found out that Intel is not supporting Windows Server 2012/R2s on NUC but there’s always a workaround. If found these links and followed the instruction and got it working. http://foxdeploy.com/2013/09/12/hacking-an-intel-network-card-to-work-on-server-2012-r2/ <— has the best method in finding out the correct driver for your machine. 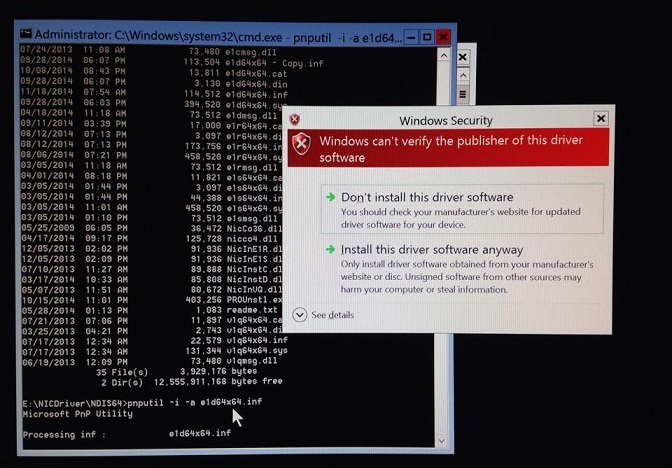 A Windows security warning will pop-up, click Install this driver software anyway. 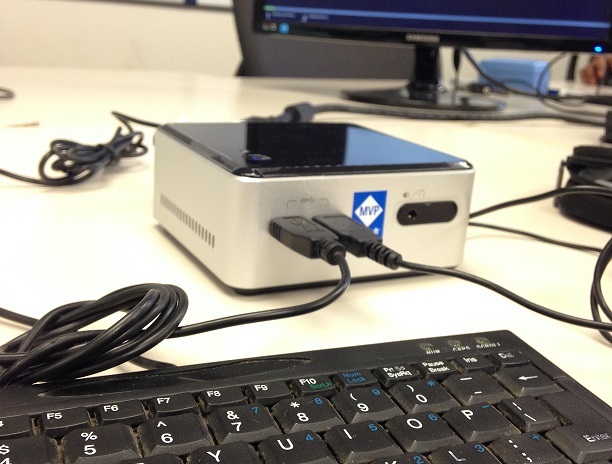 Reboot your NUC Hyper-V server and you’re all set. This workaround can also be applied to Windows Server 2012 R2 Update. Thanks for the writeup! Despite Intel releasing a driver for 2012 R-2, I was getting the same errors. I followed your instructions and now the NUC is on-line. Some adjustments to your example above, turns out that you forgot one entry for my 153b. 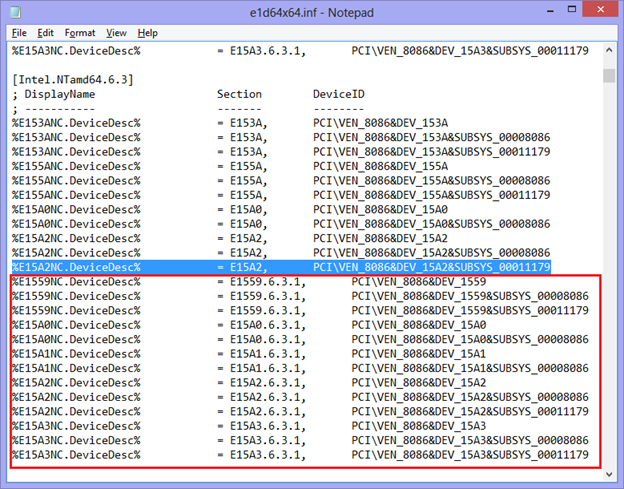 All you need to do is to copy the [Intel.NTamd64.6.3.1] section to notepad.exe and replace all instances of “.6.3.1,” with “,” then copy that section to [Intel.NTamd64.6.3] The advantage is that we use the correct DDInstall Section for server rather than for workstation. I’m installing 2012se, first edition (not R2). Followed all the steps. It says it installs successfully and driver package added.. Device Manager still shows no driver installed, even after reboot. I am using the D54250WYKH. It runs Win10Pro just fine, with inbox drivers, so I know the NIC is good. I did pull the drivers off the Win10 install using dism, but I’m betting they won’t work with Server 2012. I guess I’ll try. Dam, on Win10, the net driver is Inbox, not oem, so its not exported. setupapi.dev shows success, no errors. Do I need to modify a different inf file for 2012se? Read further, and used NDIS63 for Server 2012. Still no errors, but no functioning NIC. Cut and paste error. Working now. Table below gave me a clue. Glad to here that! I’ve recently installed Server 2016 in my NUC. I had to use the Win 10 driver. I have the original Intel NUC (Celeron 847) I have been unable to find a write-up explaining how to do this for that particular NUC. I decided to try this. I will say that the intel lan driver for the Celeron NUC has the exact same files as listed in this example. I followed the directions to the letter, and the driver installed correctly, but still the same problem…..No active network adapters found. If you are still having problems, post logs and output showing your work. Well, I finally got back to working on this. I decided to re-install hyper-v server 2012 R2 and try again. This time, when I attempt to install the inf file, pnputil comes up with an error saying: adding the driver package failed : the system cannot find the file specified. I have made sure that I am pointing to the correct location, but no matter what, same error every time. Sorry, has nothing to do with Server Core vs Server GUI, neither work with intel drivers. So i have bad luck with this one 😔 well never asked never known! Thanks for replying. Excellent post! Thinking of purchasing a NUC 5i5 for Hyper-V hosting with Win2012R2. Does anyone know if this “procedure” works for the 5i5RYH? Don’t want to be limited to Wifi connection and could use the information before buying it. This is brilliant. I did it on my brand new NUC5i7RYH and it just worked. Thank you so much for sharing. This is sweet, thanks for sharing! i just purchase a awesome NUC5i7RYH and I followed your directions. But after running pnputil -i -a D:\NDIS64\e1d64x64.inf. — CMD returns the error — “Adding the driver package failed: The hash for the file is not present in the specified catalog file. The file is likely corrupt or the victim of tampering” I plan on running the nuc/server at my house..
Hi Alex, thanks for the comment, just want to check, have you run CMD as Administrator? Thanks Jay, for your response, Yes. I did run CMD as Administrator. Hi I am trying to install the LAN drivers on NUC5I7RYH, I cannot find LAN_Win8.1_64_PROWin_19.3.exe drivers, only can get LAN_Win8.1_64_PROWin_19.1.exe. Tried to carry out the same steps but failed. Any ideas where I can get LAN_Win8.1_64_PROWin_19.3.exe or a work around for the current driver I have. Thank you! I used your instructions and the driver installed.. Please am trying to install it on my desktop. and will also install on VHD later. Can i follow the same steps? So this stumped me for a bit on my NUC5i3RYK (or NUC5i3RYH) with Server 2016 Tech Preview 4. This way I took the Windows 10 lines, compared them to the Server 2016 lines and added the missing ~4-6 lines. After that BOOM it worked great! I have had success by simply manually installing the Intel(R) 82580 Gigabit Network Connection driver… seems to work just fine. Probably a stupid question (as I don’t quite understand Hyper-V), but would these instructions still work if I’m just installing Windows Server 2012 R2 as a normal OS? I’ve ordered a NUC but only discovered after it was bought that Intel doesn’t support Server on it. Yes this still works, but you will need the latest driver from Intel. Recently my friend bought NUC and installed Windows Server 2012 R2 and applied the same steps for the network adapter to work. 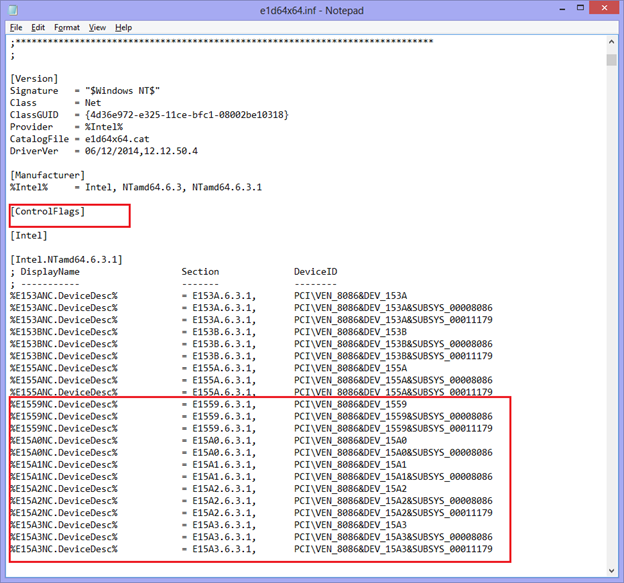 Do you know if in Hyper V 2012 there’s anyway to force a specific model of the network adaptor? Thank You for this article, it worked for Windows Server 2012 R2. My NUC5i5RYH now has network connectivity. Great hear that 🙂 glad you found this blog helpful. Thank you, for your feed back. Thank you for this article. It helps! ==> The network card appears in Network Connections window. Has anyone gotten the network driver of an Intel NUC5PPYH to work in Windows Hyper-V Server 2016 (standalone)? This also applies to Windows Hyper-V server 2016! Hi! Trying to get this to work with a NUC W34010WYK but don’t know which the correct inf file is. Any help would be appreciated. These instructions were helpful for getting the older driver to work. Although I did not understand exactly what the modifications were doing, I followed the instructions perfectly, and it worked successfully. Alternatively, it looks like the most recent networking driver for several NUC models, including mine, has support for Windows Server 2012/R2, even though the driver is labeled as if it is only for Windows 8.1. This is the one I mean: “Intel(R) Network Connections Software Version 22.6” dated Oct. 27, 2017. Take a look at the file with “Release Notes” and you’ll see plainly it was intended also for Windows Server 2012. I installed it on my NUC running Windows Server 2012 R2 without any problems, replacing the older driver from this example, and it appears to be working just fine. However, that brings me to another point, which is related to the problem created with the earlier driver. First of all, using an unsigned driver, especially a prominent networking driver, creates a security hole for malware to exploit. Also, the Secure Boot functionality enabled in the BIOS cannot work properly with unsigned drivers installed, if I am not mistaken. Additionally, having used the technique of this article originally, even though I have since replaced that driver with the newest one, there appears to be a remnant of that process affecting my machine. I am not technically savvy enough to know how to remove the problem at this point. When I look at the network adapter’s Properties page and Driver tab, it shows “Digital Signer: Not digitally signed.” Then, in Driver Details, I can see four files listed, one of which is “C:\Windows\system32\e1d64x64.din”. It shows Unknown for Provider, File version, and Copyright. Actually, I was expecting this new driver to completely replace that old one as well as the unsigned file condition. I am concerned about the security effects, but I do not know how to fix this issue. Any ideas would be welcome. Thanks. Can this method use on windows server 2008 r2? Thank you! Just made this work with Server 2016, you totally saved my a$$.